Neil deGrasse Tyson's Twitter. His 'Ask Me Anything' posts on Reddit: Novembert and December are quite popular. Authors @ Google: 73 minute video interview with him from February 2009 regarding his book, The Pluto Files, which discusses the public's response (hate mail from third graders!) to Pluto's demotion from planet status. A 2010 NOVA special on the subject, also called "The Pluto Files," recently re-aired on PBS on December 14, and can be viewed in its entirety online at their site. Video from the World Science Festival: Why Science Literacy Matters. Interview on SanDiego.com from August. An extensive archive of audio interviews is available at his site. Appearances on Real Time with Bill Maher: February 2011, August 2011. The title of this post comes from a comment he made during the August show. Appearance on Jon Stewart: January 2011. Forgot a link: Neil deGrasse Tyson, previously on Metafilter. The video link for the the post about him meeting with Carl Sagan is borked, so here's an updated link. The motivations to invest time in young people that he mentions therein no doubt keep him coming back to Reddit to answer anyone's questions. Thanks, Burhanistan. I want to watch that. The story starts out with an anecdote about a star party, with NdGT pointing out stars with a laser pointer. I remember going to those when I was a little kid. I recently got a new phone that actually came pre-loaded with Google sky map which shows you whatever stars/planets you happen to be aiming your phone at at the time. I'm sure there's something similar for iPhone. Being able to go outside at night and see which star is which so easily is really fun. Also the origin of this meme, which thankfully is not nearly as popular here as it is on Reddit. Tyson's popularity helped push me to get an 8 inch Dobsonian telescope for Christmas. Seeing my 5 year old daughter yell out, "Oh, my, GOSH," when she saw Jupiter and a few moons was enough to almost make me cry. I want her to have the same push toward science that we need, what Tyson is pushing for. It starts with kids that age and it's responsibility to keep pushing them to embrace it. I would now like fanart of Dr. Tyson in purple tights and a tube hat and a cape please. He is also a decent writer and has a new book out in February. elizardbits: I would now like fanart of Dr. Tyson in purple tights and a tube hat and a cape please. If nothing else, a quick photoshop hack of this image with a NdGT headshot. Until then, I'll copy a few interesting tweets. 31 Dec Geek Heaven -- New Year's Eve: Two marathons, one night -- SyFy channel's "Twilight Zone" and TBS's "The Big Bang Theory". 21 Dec Yup. Earlier this evening, my Geek teen daughter hacked my Twitter account. The cost of raising a SciTech literate child. 11 Dec State of the world is so bleak, that w/o utopian visions that SciFi authors provide, much of today's world would be w/o hope. 7 Dec Need a distraction today? Not only does 12+1=11+2, but the letters "twelve plus one" rearrange to give you "eleven plus two"
I've seen the "King of the Cosmos" before and that doesn't look like him. This is a great post, though. I like deGrasse Tyson. 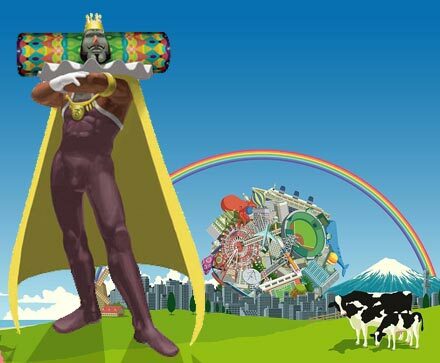 Great, now anytime I see Neil deGrasse Tyson I'm going to have the Katamari theme stuck in my head. Dr. Tyson! We built a shrine to him at my old library. Glad to see he's getting the attention he deserves. > Dr. Tyson! We built a shrine to him at my old library. Do you have a picture of the shrine? Zarq, thanks for the wonderful post! I spent my lunch hour perusing; made my day! In the first article, he's described as wowing his outdoor audience with a green laser pointer. I don't understand how you use a laser pointer outside at night, pointing it at the sky, unless there's at least a hint of fog, which in turn would ruin the stargazing. Laser beams are completely invisible in clear air.